Other Notes: "In the Zensor 1, DALI has produced an astoundingly realistic loudspeaker for its size and price. The Zensor 1's flaws are minimal, and its strengths compete with bookshelf speakers costing twice as much, or more. Therefore a DALI subwoofer is everything but a ‘boombox’. Placing a subwoofer is a very large part of creating the perfect audio reproduction. This will maximise the bass output and the distribution around the room. It even works excellently as front speaker in a 2.1 surround set-up or as back speaker in 5.1 systems including subwoofer, as the distinguished and discreet sound resource it is. The soundproof design ideas of DALI provide the background for ZENSOR 1, created in respect and admiration of music. Pictures are the actual grill. PRODUCT DETAILS Finding space for high quality speakers is not always an easy task. Finding the room for traditional Hi-Fi speakers in the living room, bedroom or kids room is always a balance between performance and size. This is for a single, like new, Dali Zensor VOKAL Center Speaker in Walnut. DALI ZENSOR VOKAL SPECS. Condition: (slightly used, works like new, read blow). Frequency Range ( /-3 dB) [Hz] 47 - 26,500. The ultra-compact speaker in the range. Front, rear or side speakers in a surround system, or alone in a compact stereo setup. WIDE DISPERSION DALI makes it easy to integrate your loudspeakers into any room. Used, slightly scratched, dust and dirt. weight: 2kg/pr. These are legendary. No issues. No defects are far as I know. Grills included. They were used in my studio which I have decided to dismantle. Only one speaker available. The grill cloth has frayed in one corner as shown in photo. WIDE DISPERSION DALI makes it easy to integrate your loudspeakers into any room. You will experience a well-integrated sound, even when listening significantly off-axis. And, as you are often not seated directly in front of the loudspeaker when listening to music, this is important. ONE PAIR WOOFER ONLY! aluminium alloy chassis. weight: 3kg/pr. Sensitivity: 90dB. DALI - Zensor 5 (Black Ash). The FAZON LCR TABLE STAND is ideal for listening rooms, where it is not possible to hang the FAZON LCR directly on the wall or for use as a center channel. Dali Fazon LCR L/R Table Stands (Pair). (2) Table Stands For Fazon LCR L/R. Opt for “ local pick up” upon check out if you are local. With its DALI-designed 5” mid/bass driver, LEKTOR 2 achieves an ultra-compact form factor for convenient, discrete installation in virtually any location. Primarily intended for your bookshelf or wall mounting, LEKTOR 2 can be stand-mounted. DALI - Zensor 5 (Walnut). The DALI OBERON 1 is a ultra compact bookshelf speaker. Given its ultra-compact size, the OBERON 1 is the smallest addition to the OBERON line-up. The compactness of the OBERON 1 makes it easy to integrate into any room. 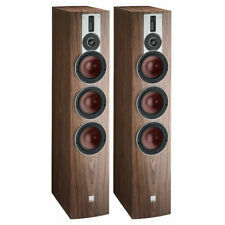 Dali Entry level speakers, great speakers for the price. DALI ZENSOR 3 is a part of the award-winning ZENSOR series. The ZENSOR 3 loudspeaker is developed and built to sound much larger than it actually is. Using a 7” woofer based on the technology from the ZENSOR 7 and the tweeter module from the ZENSOR 1, the ZENSOR 3 is able to recreate the high frequencies, the midrange and the low bass in the best possible way. Dali Fazon/Motif Sat Grille - Each (Black). ONE PAIR WOOFER ONLY! aluminium alloy chassis. weight: 6kg/pr. Sensitivity: 90dB. Dali IKON Subwoofer in Light Walnut ! DALI speakers and subwoofers are designed in various styles, and many options can be placed in common areas. These speakers produce bold sounds because they're designed with professional-grade audio components that generate vibrant bass and treble effects. 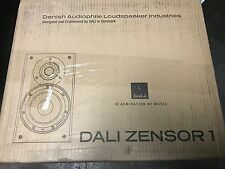 Find the right DALI speaker for you on eBay. What are the main DALI audio product design options? Bookshelf - This speaker is compact and is usually manufactured as a set. DALI offers bookshelf speakers for stereo systems and home theater equipment. Center channel - A DALI audio center channel speaker is a product that supports general surround sound audio formats. When this speaker is placed behind or in the center of a television screen, the audio hardware produces noise that sounds like it's projecting from the screen. Floor-standing tower - Tower speakers are tall and are used with surround sound equipment. DALI offers tower speaker products with woofers and tweeters. Subwoofer - DALI subwoofer products transmit low-pitched sounds. A subwoofer can enhance music that has deep bass sounds. What are the connectivity options for DALI speakers? The main connectivity options are wireless and wired. If you don't want to run wires along walls to connect DALI speakers to a sound system, you need speakers that are designed with Bluetooth technology. Bluetooth hardware eliminates cords by transmitting a wireless signal in a specific frequency range. Wired speakers have cords that connect to audio equipment. The process of moving connected speakers to different spots is never a hassle as DALI designs wired speakers with fairly long cords. What are the configuration options for DALI active speakers? What are the audio input options for DALI speakers? On the back of a variety of DALI speaker types, you'll find ports for a banana jack and a raw cable jack. Both ports help DALI speakers produce crisp sounds that are high and low. Thanks to each jack's firm grip, cables don't easily disconnect after they're connected to a speaker. Content provided for informational purposes only. eBay is not affiliated with or endorsed by DALI.